Districts face big decisions—with potentially enormous financial consequences—when it comes to buying computing devices. The Learning Accelerator is trying to give them more power to comparison-shop. Daniel Owens, a partner at the nonprofit technology organization, has been working for a year and a half with a group of school districts around the country to develop an online portal, informally called the “pricing database,” that would allow them to share information on the costs they’re paying for education technology—primarily desktop computers, laptops, and tablets. That work resulted in the creation of a prototype site (check out a screenshot, above) that has allowed the districts access to that information. Now, the Learning Accelerator is trying to solicit outside help from a foundation or business to support the creation of a fully operational site capable of housing a much bigger pool of data on ed-tech buys from districts around the country. Today, most districts are buying ed-tech devices in something of an information vacuum, Owens argues—trying to do their homework and make responsible purchases, yet without much certainty about whether they’re getting a fair deal, or overpaying. The primary goal of the portal is to give K-12 officials information on what their peers in other districts are paying for ed-tech, the Learning Accelerator official said. The site is potentially also meant to allow them to join together to make purchases, to the extent their policies allow them to do that. The impetus behind the project came when Owens began working with a small group of districts that agreed to give him pricing information on what they paid for recent ed-tech purchases. In numerous instances, districts were buying the same devices at very different prices, which could not be explained by differences in geography, time of purchase, size of the district, and other factors. That initial research led him to work with a broader group of 25-30 districts who have fed the prototype site with information and collected data from it. The information districts give is stored anonymously. The Learning Accelerator is heavily involved in the world of K-12 ed-tech. The Silicon Valley-based organization’s mission is to promote blended learning, but its efforts are broader than that. For instance, it is currently helping to fund and organize a major effort by 12 states and philanthropies to develop and promote “open educational resources;” free, open license materials meant to act as alternatives to commercially developed products. The process of collecting information about districts’ recent purchases of desktops, laptops, and tablets isn’t always simple. For one thing, districts don’t gather and report data on pricing and purchasing in a standardized way, Owens notes. The prototype site for the portal allows anonymous users to sort through that data and isolate specific device features, and collect information from similarly sized districts. Eventually, the site could expand beyond price comparisons of devices to other forms of ed-tech, Owens said. But for now he sees the device comparisons as the best way to test the concept. Owens is still weighing how to make the full-fledged portal financially sustainable. One option he’s considering is charging users some kind of a fee, based on how they’re using the online database. Efforts to promote information sharing across school districts, to help them make smarter purchasing decisions, are in one sense not new. The Council of the Great City Schools, for instance, has put forward metrics to encourage school systems to make financially shrewd decisions in areas such as information technology, finance, transportation, and human resources. One has to imagine that ed-tech vendors wouldn’t be fond of a portal that compels them to justify why they’re selling laptops at one price in District A and another price in District B. But Owens believes some vendors could embrace the tool, and use it to spot trends in purchasing and crunch data in way that makes them more knowledgeable about the market. He says he doesn’t anticipate a legal fight from vendors who don’t want pricing information released. That contract information is public, he points out—and above all, it’s important, given that it cumulatively amounts to many millions of dollars nationwide, per year. “We think purchasing should be a two-way street,” he said. 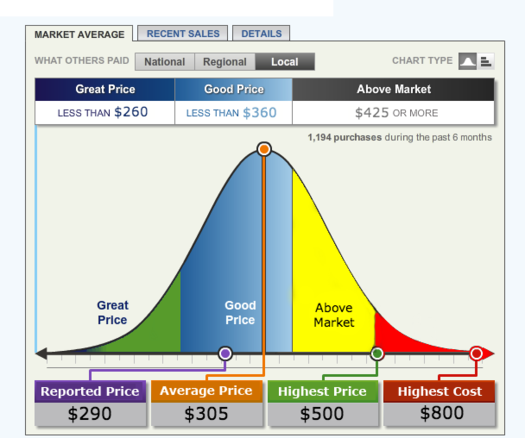 Image: A screenshot of the pricing portal shows the representation of the pricing distribution for a device. It is broken into quartiles, with 25 percent of districts paying the lowest price, 25 percent paying a below average price, 25 percent paying an above average price, and 25 percent paying the highest prices. It is meant to give districts a benchmark to understand how the price they paid measures compares to those paid by peer districts. Courtesy of the Learning Accelerator.